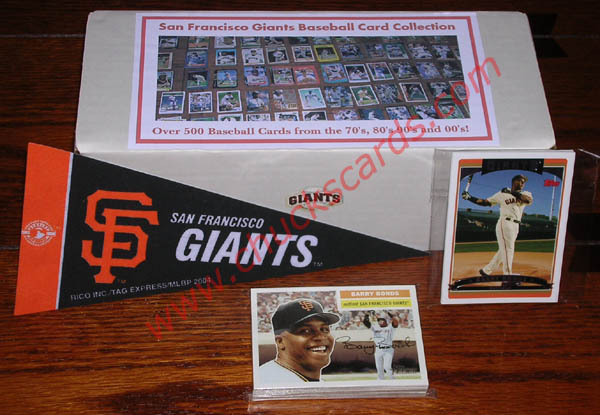 This FAQ page describes the 500 Different Baseball Card Team Collection packages available for most MLB teams! 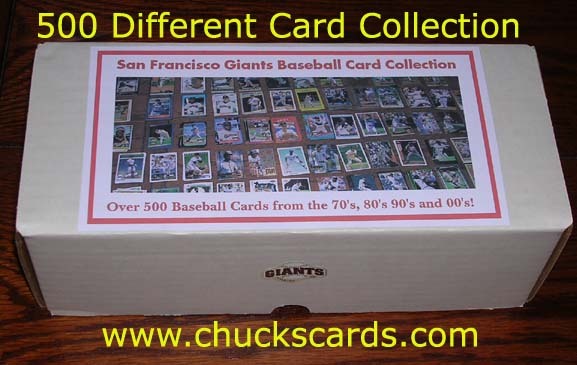 My Team Collection package features over 500 different baseball cards of your favorite team! Spanning four decades, this collection is made up of the many different stars, rookies and everyday players that played for your team from the 70's, 80's 90's and today! This package would make an excellent gift for that special somebody that collects baseball cards. Or if you are collecting these for yourself, there is no need to go out and buy 100's of packages just to collect the cards of your favorite team, I've already done that for you! I have included many different brands of baseball cards in this collection. You will get cards from well known brands such as Topps, Upper Deck, Fleer, Donruss, Score, Stadium Club, Finest, Leaf, Fleer Ultra and more! I can't even begin to list some of the premium They are loaded with Stars, Minor Stars, Rookies and everyday players. A 4X9 Pennant of your team! I only have 1 package available for each team and once it is sold, it may be a long time before another package is offered. I spent the better part of a year preparing these packages, sorting out over 15,000 baseball cards into the different teams, counting, removing duplicates and low grade cards, recounting and so on. Don't delay and lose out on this deal to somebody else! To also answer some pre-questions on the 500 Different Baseball Card collection, I have added a FAQ below to help out. If you have further questions, you are always welcome to contact me. What condition are the cards in? All of my 500 Card Collection Packages that I have for sale consist of cards that are in Ex+ to Nrmt condition. Most cards (95%) from the mid 80's thru the 2007 cards are in Near Mint conditon. Cards from the 70's and early 80's will range mostly from EX/EX+ to NrMt condition with very few cards grading EX and under . Cards from the 70's and early 80's that are in less than NrMt condition will have very minor flaws. Soft corners, minor border chipping and bordering are the main reasons why a card would be graded in less than Nrmt condition. All cards are clean with no wax or gum stains. I am also including an extra 10-20 cards with each package in the chance you are not happy with the condition of a card or two. Note: On cards that are in less than EX condition, most of these are all major stars that I could not include with my regular team sets, so I decided to include them with the packages. One of the cards is from the Reds Collection, a 1971 Pete Rose card this is in G/VG condition. The card in Nrmt condition books for $100. A G/VG card would fetch about 10-15% of Nrmt book value so the card is still worth about $10-15. That card alone is nearly half the asking price of the package. One is a 1960 Topps Dodgers Duke Snider card which is in Poor condition. It is a card that I figured a Dodgers fan would love even in that condition. What types of players are included? Are there Stars and Rookie cards? I have included stars, rookie cards, minor stars and the common every day players that the teams have had over the past 3 decades. What brands of cards have you included and what years were the cards produced? You will find many different brands and years included in this package. You will find Topps, Upper Deck, Leaf, Fleer, Donruss, Score, Stadium Club and many more well known brands. Most teams will have cards that go back as far as 1972 and go through 2007. When you say 500 different baseball cards, do you mean I am getting 500 different players? Not at all. With this package you are getting 500 different baseball cards. You may get one card of Joe Player and you may get several cards of Joe Star-Player. But no 2 cards of a particular player will be the same. For example, the Baltimore Orioles package has at least 10 Cal Ripken Jr cards, but all those cards are different from each other. Are there any cards of value in these packages or are they loaded with junk commons like I find on online auctions? A friend of mine once bought one of these 500 card deals from an online auction. What he got was 482 cards with some duplication and most of the cards were absolute commons. I can assure you that my 500 count collection packages have a great deal of value. There is a great assortment of stars and rookie cards that more than make up for the cost of this package. Here are some examples of cards that are found in some of the packages. I'll also mention right now that those cards listed above are not the most valuable cards in those packages! A 4X9 inch size Pennant of your team, valued at $2.50. I also will point out that I broke down a 1994 Leaf Limited Set that was missing one card (Cubs), and included all the cards in the 500 count lots. So you are actually getting a 3rd complete team set where they are valued from $5 - $10 a set! So from the 3 team sets and the pennant, you're already looking at a between $15-$27.50 of value even before you get into the 500 cards themselves. Plus, remember. These are 500 cards of one team. If you went to a card store in your area, how much would commons alone cost of your team? Anywhere from .10 - .25 each! Except my packages are not all commons and contain stars, minor stars and rookie cards! How much will shipping cost on this package ? The packages weigh roughly about 4 pounds. Any U.S. Destination west of the Mississippi river will be $8.10. Destinations East of the Mississippi river will be between $5.75 - $8.10 depending on location. All packages will be sent using USPS Priority mail. Delivery confirmation will be provided for free for tracking purposes. However, insurance is optional on these packages and if you wish to have the package insured, it will be an additional $1.30 to the total cost. One of the teams I am interested in is not available at this time. Will you be offering a 500 card package on this team soon? Currently, the only teams I do not have available are the Devil Rays, Diamondbacks, Marlins and Rockies. I will put together a smaller version of this package for these teams soon. Here is what you are getting. 500+ Baseball cards, a Team pennant, a 2005 Topps Heritage and a 2006 Topps Team set of your team! If you're favorite team is showing Sold, I do have Baseball Card and Gift Sets available for your favorite teams as well!